In just over 2 weeks I will be making the trip over to Las Vegas for my 3rd VMworld event. That is just the two events from last year both US and Europe, it is still a little crazy to think I have been in this game for a few years now and this is only my third time attending. My first VMworld post from last year. I wanted to put a short post together just highlighting some of the things that Veeam and I will be doing at this year’s event. For the official Veeam at VMworld page you can get that here. Every year Veeam has at least two sponsored sessions, it is our team’s responsibility to create and deliver at least one of these sessions, this year it is our team delivering the sessions. It is very important that we make these sessions as informative as possible and engaging, we don’t want them to be the run of the mill sponsored sessions and you will see that mine and Anthony’s session is very much showing the art of the possible. Personally, and this was the case before I even joined Veeam. The what’s new session that is always on the agenda and normally delivered by Anton Gostev but for the last year it has been delivered by Danny and Rick. This is my favourite session, it really sets out the lay of the land and where Veeam are and where they are going. Highlighting the new features and functionality that is coming over the next few months. For our session we will be diving into VMware on AWS and how Veeam just works there. But we will be taking things to the next level and showing how as we move into the world of automation, how we can easily spin up our Veeam environment in any location to help drive the availability regardless of where that data resides. We will also be touching on how Veeam Availability Orchestrator can be used between VMware on AWS to provide disaster recovery and business continuity. We also just got a room upgrade because the amount of registrations was shooting up so expect a large room. Oh, and the last thing to mention is the live demos… much of this session will be backed by many live demos. 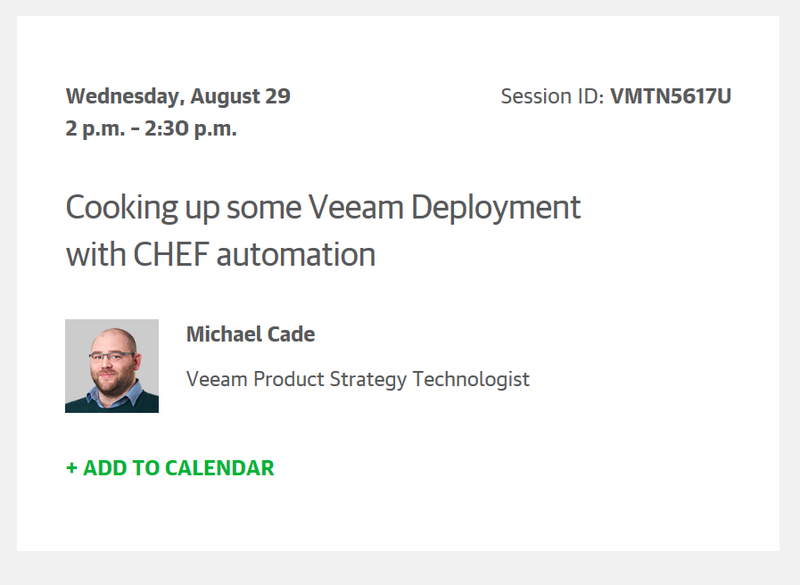 I also have the pleasure of returning to the vBrownBag for a VMTN TechTalk, this year I have taken both slots and combined them up for a 30-minute session on how CHEF can be used to dynamically build out your Veeam environment from a single all in one system to a complete scaled out distributed architecture in a large enterprise. That bit is not the hard bit, the best thing about this is the ability to dynamically provision or tear down these resources so they are only up and running as and when you need them. I will try and squeeze that into the 30-minute window. Now this has always been a thing with Veeam, but I don’t recall the number of free passes being so high! 10 passes are up for grabs and if you are one of the lucky winners then you can choose which event you would like to attend. The few things I ask though if you are one of the lucky winners, obviously attend our sessions but also make the most of it, you probably entered because you didn’t get the chance from your employee and if you are that winner then make the most of it. Yes, I said that twice. I never got the chance in my previous roles to attend but already last year I can see the power of community at this event, the out of hours is where that networking happens. Yes, the technical side of things is interesting for us but it’s the conversations the ideas within the community that make it what it is. My second ask is write about it, write about your experiences during VMworld and carry that on after. The next important matter to mention is the legendary Veeam party, I got to experience both the US and the European parties, and they are different, but the event is special. Not only that the locations are special as well, Hakkasan was great last year but it is so last year. This year we have Omnia and from what I have heard it’s a cool place for a party. You will find the details below, you can also click the image below if you would like to register. A VMworld 2018 Badge is required for entrance and will be scanned at the door. Must be 21+ years of age with proper ID. Passport required for International guests. Each Attendee Must Register Separately. Finally, please come and speak to us at the Veeam booth #1412, there will be great prizes up for grabs every day and the failsafe Veeam t-shirts being given out. Previous Post: System Administrators – The emergency services of the IT world!